GRAND RAPIDS, MI â Gage Barnes was among the early arrivals to the Briggs Park pool’s opening day this afternoon. His admission fee: $1. But, to him, cost was no object with temperatures rising into the 90s. After all, you canât cool off with a pencil dive into a backyard kiddie pool the way you can under the supervision of lifeguards at a city park. “Would you rather have a little teeny pool (in the backyard) or a big pool where everybody’s safe?” said Gage, 9, standing at the edge of the large pool that features four elevated lifeguard stands, two diving boards, one water slide, a water fountain and a wading pool. The 7-week city swimming pool season began today at Briggs and at Martin Luther King, Jr. and Richmond parks. Several wading pools and splash pads also now are open across Grand Rapids. The wading pools and splash pads are free. And, for city kids like Gage, admission to the city swimming pools costs half what it did last year. Grand Rapids cut prices this year after attendance took a dip in 2011. Admission for Grand Rapids residents ages 1-17 is $1 this summer, and it’s $2 for adults. Babies younger than 1 are free. The fee for non-residents is $4. The price cut was a pleasant surprise to Barnes. But it made a big difference today for Lynnette Chaney, who came to the Briggs pool with two children, a neighbor child and a 1-year-old granddaughter. Last year’s higher rates kept her from coming to the city pools, she said. That’s great for Chaney, but the city at large subsidized her recreation at the pool today. Based on last year’s pool attendance, the $594,000 cost of running three city pools for seven weeks this summer equates to $24.44 per swim. Perhaps Chaney should have paid $122 in admission this afternoon, instead of $6. Grand Rapids administrators say they can’t afford to operate the swimming pools, so they are coming up with a plan to make them more affordable. Among the concepts being explored: closing city pools one by one and replacing them with less-costly splash pads, and seeking a millage to keep operating the swimming pools. 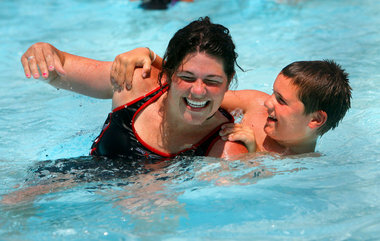 A longtime city pool customer, Laurie Vance brought eight of her 12 children â ages 5 to 28 – to Briggs this afternoon. She called swimming “a full family event” that both teaches a life-saving skill and builds “a sense of community” for Grand Rapids residents that canât get out of the city to other aquatic recreation. Grand Rapids is selling family passes that cost $80 for the season, regardless of household size. Bulk discounts also are available for purchase of admission punch cards. Jake Lang and Amber Peterson this afternoon paid the $2-per-adult price for a day pass, then enjoyed chummy embraces in the pool amid the splashing all around. “I live right down the road,” said Lang, 20. “It’s really close and convenient.